In the Lenten letter of this year, Fr. Tomaž Mavrič, CM, 24th successor of St. Vincent, invites us to reflect on the Virgin Mary in the Vincentian tradition, as one of the pillars in the spirituality of St. Vincent of Paul. You can read it below. At the end of the letter, several links are offered to download it in various languages. With the Advent letter in 2016, we began reflecting on the pillars of Saint Vincent’s spirituality: the Incarnation, the Holy Trinity, and the Eucharist. In this Lenten letter, we will reflect on the fourth pillar, the Blessed Virgin Mary. As we start Lent, 40 days with Jesus in the desert, I would like to invite all of us to fill our hearts with the warmth, trust, availability, and all the love a son or daughter can have toward his or her mother. May we also make our own, renew, or deepen a lifelong commitment to her by following three steps, which will help us be closer to Mary, our Mother in Heaven, who is a preeminent model, showing us the best and shortest road to bring us to Jesus, our life’s goal and our all! Together with Mary, we reflect on the different stages of Jesus’s life. Mary walks with us, Mary accompanies us, Mary encourages us, Mary inspires us! Let us always carry a rosary with us wherever we go. Let us bring it with us in our pocket or purse, as a ring or a bracelet to be available at different times of the day. We can pray it in the chapel; walking on the street; waiting for the bus, metro, or train; driving a car; going for a walk; waiting in long lines. Let us keep the rosary always with us. God always kept alive in me the conviction that I would be freed because of my unceasing prayers to Him and to the Blessed Virgin Mary, through whose sole intercession I firmly believe I was delivered. Everyone is well in the four places where missions are being given and here also, so it seems that Our Lord will take pity on this Little Company through the intercession of the Blessed Virgin. With that end in view, we have sent M. Boudet to pay a visit to her at Chartres. Saint Vincent de Paul gives Mary as the example of all virtues, but he highlights two of them in particular: humility and chastity. Among all those created in heaven and on earth, there is no one better known, more venerated, more often set before us as a role model. There is no other person in whom God, through Jesus, placed more trust. Mary does not think, even for a single moment, that this is to her merit, but considers all she is and all she has as grace, as gift, as a sign of mercy coming from Jesus. The mother puts herself below her son and not above him. Mary gave birth to Jesus, nurtured Him from the manger, changed His diapers, breastfed Him, and raised Him to adulthood. Mary, by all she did and does today, points us always toward Jesus. … run to the Blessed Virgin, asking her to obtain for you from her Son the grace to share in her humility, which caused her to be called the servant of the Lord when she was chosen to be His mother. What made God consider the Blessed Virgin? She tells us herself, ‘It’s my humility.’ I don’t need to tell you that, if our Sisters have recourse to the Blessed Virgin, who loved this virtue so much, she’ll obtain from God the grace for them to practice it. Jesus gives us the key for how to walk in purity of thought, word, and action. Jesus tells us to pay attention: “It is not what enters one’s mouth that defiles that person; but what comes out of the mouth is what defiles one” (Matthew 15:11). Everything has its beginning in our heart and our mind. Let us ask Jesus to be there from the beginning of our thoughts, feelings, and ideas, to help us filter them through His thoughts, His attitudes, and His actions. What flows from our thoughts will appear then in words and actions that will reflect Jesus’s behavior, Jesus’s feelings, and Jesus’s thoughts. Purity will be present and lived in our lives. Have a particular devotion to the way the Blessed Virgin guided Our Lord, and all will go well. However, thoughts, feelings, and ideas that are not filtered through Jesus will lead us in the opposite direction. We become vulnerable to the influence of the “evil one,” who has a clear goal: to destroy in us all that comes from God, to destroy our relationship with Jesus. Satan wants to put himself in the place of Jesus, to influence the thoughts from which our words and actions flow so that we, by opposing chastity and purity, deform our beautiful self, our beautiful heart created in the image of God. … the secret of your heart, which I truly wish may belong entirely to Our Lord. I beg the Blessed Virgin to take it from you so as to carry it off to heaven to place it in her own and in that of her dear Son. After the cross, the Miraculous Medal is the most widespread Christian symbol around the world. However, many still have not had the opportunity to hear about it, to learn Mary’s message, to receive and wear the Miraculous Medal. They do not receive graces from Jesus by asking for them as Mary instructed Saint Catherine Labouré, a Daughter of Charity, during the apparitions of 1830 in their Motherhouse chapel on the Rue du Bac in Paris. Come to the foot of this altar. Here, graces will be spread over all who ask for them with confidence and fervor. These rays are a symbol of the graces that I pour out on those who ask them of me. 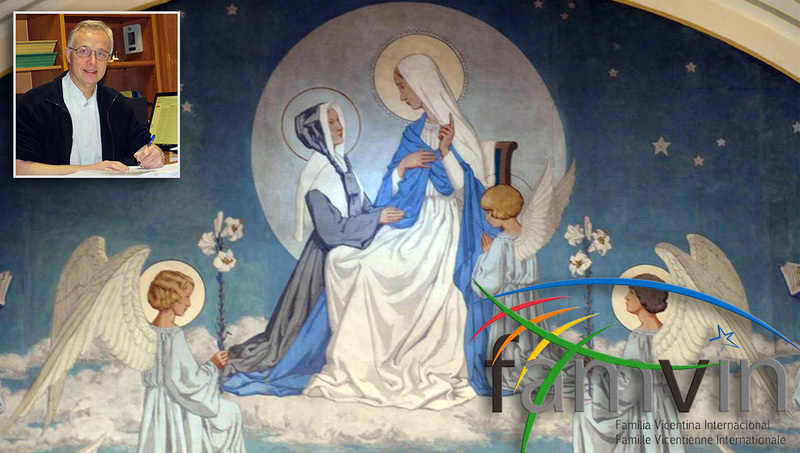 organize a local group of the Miraculous Medal Association, which would become part of the International Miraculous Medal Association, one of the branches of the Vincentian Family present in many countries of the world. Encourage the foundation of a new group of the Miraculous Medal Association in your local parish with the permission of the parish priest; in hospitals, dispensaries, schools, and universities with staff, teachers, professors, students; during parish missions where different branches of the Vincentian Family take part in organizing and coordinating them; missions, etc. Invite people to register to become members of the group. In many countries where the Miraculous Medal Association is present, a National Council, uniting all the different local groups of the Association present in that country, coordinates it. The National Miraculous Medal Associations are linked to the International Miraculous Medal Association, coordinated by the Sub-Director, Father Carl Pieber, CM. By becoming part of the Miraculous Medal Association, the members support each other through prayer, engage in spreading the Miraculous Medal, and perform works of charity. To make this a reality, the International Secretariat of the Miraculous Medal Association will be very happy to help those who may need assistance, information, or suggestions on starting a local group. If the country where you wish to establish a new group of the Miraculous Medal Association already has other groups or a national structure of the Association, the International Secretariat will connect you with them. If the country does not have a national structure or any local groups, the International Secretariat will help with all the information needed to start a new group. The International Miraculous Medal Association has a website in six languages, where you can find much information, including how to start a new group. The website address is www.amminter.org. If you need further assistance of any kind, please write to the following email address: mmainfo@famvin.org. As we reflect on organizing new groups of the Miraculous Medal Association in any given country of the world, let us keep in mind that it is Mary’s deep desire to spread the Miraculous Medal to the farthest corners of the world. Our Lady assures us that if we ask for graces from Jesus, we will receive them! Let us engage in this wonderful adventure by being Mary’s voice expressing Jesus’s unconditional love for every single person, in word and action. Have a medal made according to this model. For those who wear it with confidence, there will be abundant graces. spreading the message of and devotion to Our Lady of the Miraculous Medal with renewed zeal. May the 40 days with Jesus in the desert renew our hearts, making us open to daily “resurrections,” passing from death to life in preparation for our ultimate Resurrection! Vincent de Paul, Correspondence, Conferences, Documents, translated and edited by Jacqueline Kilar, DC; and Marie Poole, DC; et al; annotated by John W. Carven, CM; New City Press, Brooklyn and Hyde Park, 1985-2014; volume I, p. 6; Letter 1 to Monsieur de Comet in Dax. Future references to this work will be indicated using the initials CCD, followed by the volume number, then the page number, for example, CCD I, 6. CCD I, 350; Letter 249, To Robert de Sergis in Amiens, November 1636. CCD X, 431; Conference 98, Humility, Charity, Obedience, and Patience (Common Rules, Article 42), 14 July 1658. CCD II, 140; Letter 488, To Jacques Chiroye in Luçon, 6 October 1640. CCD I, 62; Letter 36, To Saint Louise, [Around 1629].